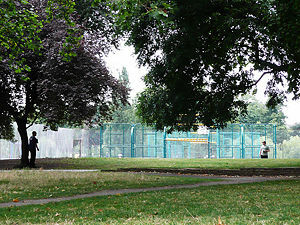 Ludocity is a collection of pervasive games, street games and new sports - social forms of play that take place in public spaces, such as city streets, parks and public buildings. 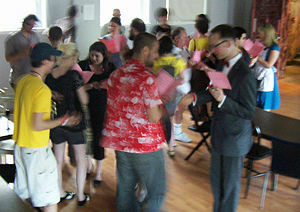 Some of the games on Ludocity overlap with theatre, painting, dance, and other art forms. Some of them use balloons, lumps of coal, huge sheets of paper, mp3 players, elaborate costumes, and short-range radio broadcasts. All of them have had their rules released under a creative commons licence, giving everyone permission to run that game for free, wherever and whenever they like. 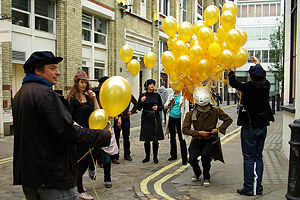 The Soho Stag Hunt, played as the finale of the Soho Project ARG, 2007. If you've got a game you'd like to submit to the site - either an old one that you've run in the past, or a new one that you're working on - our game writeup guide will tell you how to post it to Ludocity so that the rest of the world can play it, or help you finish designing or playtesting it. Social strategy in Conversation Piece at Sandpit #4. Take a look at our list of games - all of these have been tried and tested, and just need you to print out the rules and gather together whatever props, locations and assistants the game might require. So long as you credit the designer and don't make any money from it, you can run the game anywhere you like. If you'd rather play a game that someone else was running, we've got a game calendar that lists all the pervasive gaming events that we've heard about. A leafy standoff in Hunt the Scavenger. Ludocity is all about feedback, questions, player reports and general discussion. If you want to talk about any aspect pervasive games, click the discussion link at the top of that page. And if you've already written or blogged about your experiences of playing a game that we've got on the site, feel free to add a link from the article itself. This page was last modified on 3 March 2015, at 16:59. This page has been accessed 694,144 times.